We just released Dashcam Viewer v1.8.5 for Macintosh and Windows. Added support for LUKAS LK-7200 car DVR. We just released Dashcam Viewer v1.8.4 for Macintosh and Windows. Added support for Koonlung K1S dashcam. This is a 2-channel dashcam (front and rear). 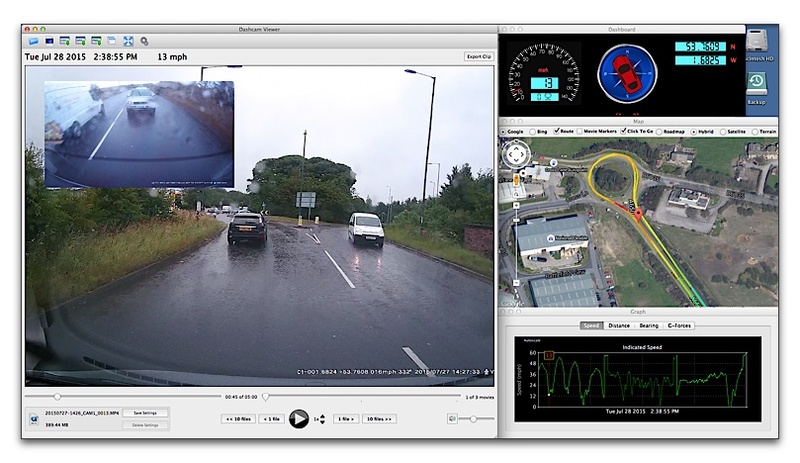 Both channels are displayed simultaneously (picture-in-picture) on the Mac version of Dashcam Viewer. If a CAM1 movie is loaded, DCV will attempt to find the corresponding CAM2 movie. The Windows version will display CAM1 only at this time. The Player window position is now saved from run to run on the Windows version (it was already saved in the Mac version). Improved speed of dashcam model auto-detection in some cases. This leads to faster loading of files. Fixed bug that made Dashcam Viewer act strange if the Player finished the last movie in the series and the user then tried to scrub to an earlier part of the series.